As the parliamentary elections of 7 October 2016 loom, bills comprising the reform package promised by King Mohammed VI at the height of the Arab Spring movements in 2011 are finally coming into force. Among these is the adoption of the Amazigh language as an official language and its use in the administration, public services, and schools. However, progress is slow and some Amazigh cultural traditions are still banned. The recognition of Tamazight in Morocco follows that of Algeria establishing it as a national language earlier this year, but not as an official language. Morocco is adopting Amazigh spoken by its Berber community as an official language alongside Arabic, rounding off a reform programme launched by King Mohammed VI in 2011. The government adopted bills on the use of Amazigh and on the right to strike, the royal palace said on Monday night [26 September 2016]. It said the language bill covers "the methods of (its) integration in education and in different sectors of public life" in Morocco. The cabinet also approved the establishment of a royal institute on Amazigh culture. On the labour front, conditions and terms have been adopted on the right to strike, a first in the history of the former French colony. With the Arab Spring in full swing and pro-democracy protests breaking out in February 2011, Mohammed swiftly drew up a package of constitutional reforms aimed at around 20 laws being passed by the end of 2016 on public and institutional life in the North African kingdom. Parliamentary elections are scheduled for October 7 , after which legislators are to adopt the last two bills. The new constitution in 2011 recognised Amazigh, three dialects of which are spoken in Morocco, as an official language along with Arabic. The Amazigh bill defines its use in the administration, public services, schools, "information and communications, and cultural and artistic creation." 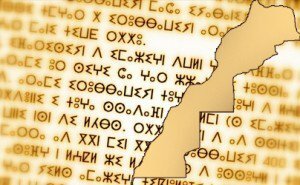 The Tifinagh alphabet of the Berbers has already started to appear on public buildings, vying for space with signs in Arabic and French, and a Tamazigh-language television channel went on the air three years ago. According to a 2004 census, eight million people – a quarter of Morocco's population – speak a dialect of Amazigh. The law on strike actions imposed strict curbs on the right to take industrial action, already banned in a number of public service sectors and limited in others such as health care, transportation, energy and garbage collection. Adoption of the law on strikes could further poison relations between the government and unions who have condemned pension reforms, according to local newspapers.